We at VIVAAN love our rose cut diamonds and its legacy always intrigues us. Sharing with you its wonderful history. Rose cut diamonds first emerged in India during the 15th century but they gained popularity only during the Georgian era., 17th century and the Victorian period, 19th century. Most rose cut diamonds that belong to the 17th and 18th century have a unique personality to them. During the early 19th century however more sophisticated and brilliant shaped rose cut diamonds were found due to advancement in the diamond cutting technology. The rose got its name from its blooming appearance, with each facet resembling a petal within a rose. The rose cut diamond has a flattened base and a domed top. Though it can take any shape yet its most popular forms are squarish-round, pear and oval. Rose cut doesn’t affix much to a symmetry. It is mostly comprised of 3 to 24 facets. Its flat pavilion and fewer facets mean that it can only shine and not sparkle. Its cut is also responsible for accentuating the flaws within the stone, yet its imperfections to an extent increase its vintage beauty. Rose cut diamonds are made and polished by hand, so they have a less manufactured look as compared to the brilliant round. rose cut is making a comeback to the jewelry scenario thanks to surging interest in vintage-style jewelry. 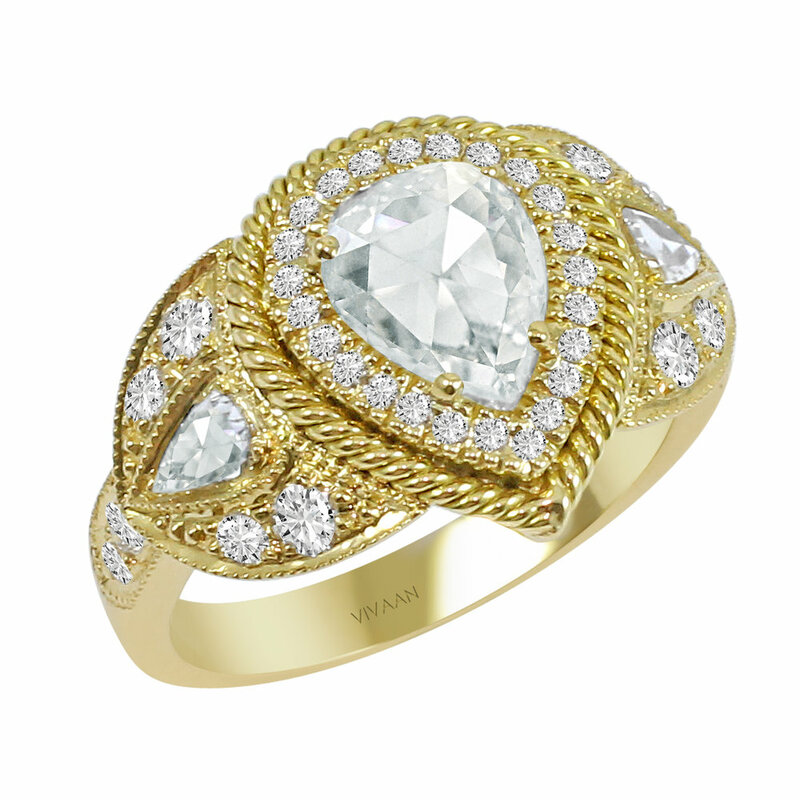 It emits a warm radiance, which is quite enchanting, it creates a unique center piece stone in the engagement rings which brings a vintage charm and understated beauty to the ring and makes it stand out. So, are you considering buying rose cut diamonds? We at VIVAAN are here with our vast selection of rose cut diamond engagement rings in a plethora of colors, to suit all budgets and to match all tastes. We pride ourselves on our exquisite craftsmanship and detailing. Our expert diamond cutters in Surat, India are one of the few in the world who have perfected cutting of this delicate style of diamond and we are the leading diamond jewelry producers of this subtle cut.